Hey everybody! Thanks to your efforts, we’re now up to 879 brown dwarf candidates. Wow. We’ve been following up your discoveries as fast as we can, getting spectra to determine their spectral types and distances, test for membership in moving groups, and look for unusual features. For the coolest objects, we’ve also been working on taking new images. Here’s a little update on all this follow-up work. First of all, we have a big stack of new spectra. Jackie Faherty confirmed 17 of our brown dwarf candidates with the ARCoIRIS spectrograph on the Blanco 4m telescope in Chile, and Jonathan Gagné, Jackie Faherty and Michaela Allen observed another batch of 8 targets with the SpeX spectrograph on NASA’s Infrared Telescope Facility (IRTF). Of those 8 we observed with IRTF, 6 are brown dwarfs. The other two are late Ms; one has a co-mover (spotted by Tadeas Cernohous) and the other has an unusual J band flux that threw off our initial spectral type estimate. 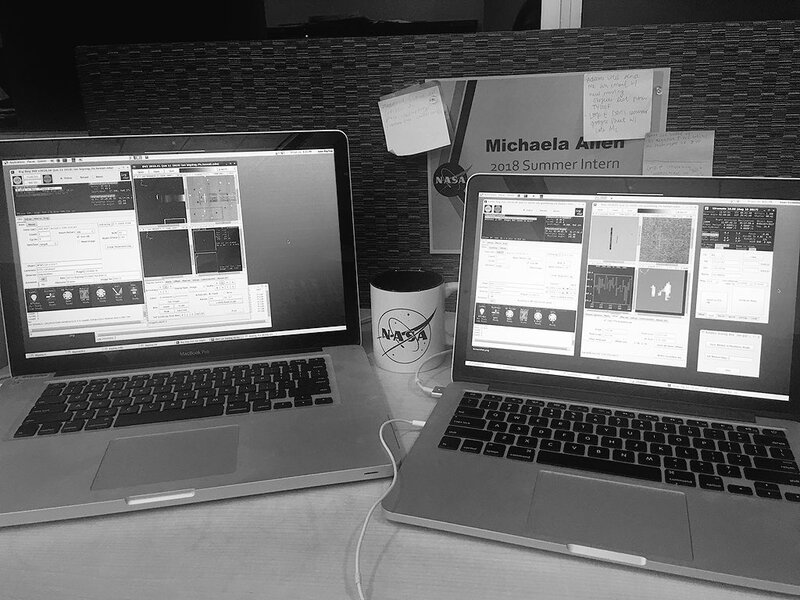 Picture of Michaela Allen’s desk at NASA Goddard Space Flight Center while she was observing our brown dwarf candidates remotely with the IRTF telescope. That’s right, Michaela, our TALK moderator, is now participating in observing runs! Michaela is spending her summer as a NASA intern here at Goddard Space Flight Center in exotic Greenbelt, Maryland. She’s working on our Gemini data, and looking through the long long list of moving objects you have found that did not appear, at first glance, to be brown dwarfs. You can follow her on Twitter @sasstronaut42 to find out more about how her summer is going, and you’ll hear more about her work later on. Thanks to Jackie, Jonathan and Michaela’s hard work, I can now say that we have confirmed a total of 42 brown dwarfs. These confirmed objects include 10 L dwarfs and 32 T dwarfs. Of these, fourteen are closer than 20 parsecs, and four are closer than 15 parsecs. Congrats to Nikolaj Stevnbak Andersen, Dan Caselden, Guillaume Colin, Sam Goodman, and Melina Thevenot, whose TYGO form submissions were observed with ARCOIRIS and confirmed to be brown dwarfs! And congrats to Nikolaj Stevnbak Andersen, Dan Caselden, Tadeas Cernohous and Guillaume Colin, whose TYGO submissions were observed with IRTF and confirmed to brown dwarfs! I believe those are Nikolaj’s, Tadeas’s and Melina’s first brown dwarf discoveries. The “seeing” at IRTF was only about 0.8 arcseconds, which is poor for that site, and there were thin cirrus clouds. So we were only able to take decent spectra of objects brighter than about 16th magnitude in J band. So this run was a bit disappointing. But just today we learned that we won four more nights on IRTF this fall! In fact, here’s a summary of our follow-up program so far—where we’ve been an where we’re going. The “R” value is the spectral resolution of the spectrograph we’re using. R = the central wavelength of the spectrum divided by the smallest difference in wavelengths the spectrograph can distinguish. So larger R means finer resolution. But finer resolution comes at a cost; you need to collect more light to begin with if you’re going to spread it out more by wavelength. Table 1. Status of our follow-up observing program. Keep up the amazing work! And stay tuned for more cool discoveries!! Has a cross-check been done with Gaia DR2? My guess would be that most 879 are too faint in the Gaia filters/detectors to register as a point source, but any which aren’t would say a lot about them, right? Great idea, Jean! Yes we’re working on a DR2 cross-match. And as you intuited, most of the 879 are not in the data release. But those that are may tell an interesting story. Stay tuned! Next Next post: The Reboot Is Here!